Home » Current Shows » Music Shows » Archive for category "Run For Your Life!" Category Archives: Run For Your Life! 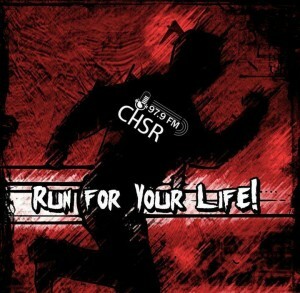 Join us for CHSR’s own Run For Your Life, which features host Matt Nightingale alongside a random list of guests, though most frequently Guest 1 who is known only for the label on his microphone. Run For Your Life is an underground-focused rock/punk/metal show which takes requests! Also, we’ve decided that all of you need lessons in survival that are entirely irrelevant. Sure, follow our advice. It won’t help you. But at least you’ll be smiling when you disappear off the face of the Earth. Fridays at 5 PM, only on CHSR 97.9 FM. Be sure to check out the feature song of the week from Beneath The Grid, based out of a golden helicopter somewhere in the Galapagos Islands. Or something random like that. How Can I Get My Awesome Metal/Punk/Metal stuff on air? Or just randomly harass the hosts? Toss a message Matt’s way at RunForYourLifeCHSR(at)gmail.com or find him on facebook. He’s usually pretty good about stuff like that. Usually. Posted on 2019-04-19 by Matt Nightingale Posted in Run For Your Life! Don’t mind me, just surviving third winter. Posted on 2019-04-05 by Matt Nightingale Posted in Run For Your Life! Well, here we go again. This time, with feeling! No wait, the other thing. Posted on 2019-03-29 by Matt Nightingale Posted in Run For Your Life! Posted on 2019-03-15 by Matt Nightingale Posted in Run For Your Life! We have a way to see how many automated search engines find our posts. I found out by asking Jeeves. Posted on 2019-03-08 by Matt Nightingale Posted in Run For Your Life! Posted on 2019-03-01 by Matt Nightingale Posted in Run For Your Life! Posted on 2019-02-22 by Matt Nightingale Posted in Run For Your Life! Posted on 2019-02-15 by Matt Nightingale Posted in Run For Your Life! If you’re reading this, you win! I’ll decide what later, maybe. Posted on 2019-02-08 by Matt Nightingale Posted in Run For Your Life! We’re back. We never left, but we’re back. Posted on 2019-02-01 by Matt Nightingale Posted in Run For Your Life! Someone pay me to stay on vacation. I’m on vacation and still making new episodes! What’s a vacation? I can barely afford groceries. A last message to humanity before the snow came for us all. Posted on 2019-01-11 by Matt Nightingale Posted in Run For Your Life! It’s 20189, the future is bleak and nothing has changed! That’s not a typo! Run! Posted on 2019-01-04 by Matt Nightingale Posted in Run For Your Life! Posted on 2018-12-28 by Matt Nightingale Posted in Run For Your Life! Posted on 2018-12-21 by Matt Nightingale Posted in Run For Your Life! I will not sneak any clickbait-style text into my adverts. FIND OUT HOW BY CLICKING HERE. Posted on 2018-12-14 by Matt Nightingale Posted in Run For Your Life! Seriously, just music and escapism here. What more do you want? This episode has nothing to do with the ongoing controversy about a song written in 1944. Sleepless days and sleepless nights! There’s a reference, probably. Click this for more! Posted on 2018-11-16 by Matt Nightingale Posted in Run For Your Life! Do you like friendship and happiness? Don’t read between the lines but do enjoy the music! Posted on 2018-11-09 by Matt Nightingale Posted in Run For Your Life! Over the weekend, I highly suggest you go on a Wiki-trip down Dadaism lane. Posted on 2018-11-02 by Matt Nightingale Posted in Run For Your Life! The word “Provide” shows up four times in this week’s write-up. Find out how!